SHOP OPEN! PLUSH AND BOOK PREORDERS! This year I have decided to bring 2 new plush and a brand new art book to my site for pre-orders! click to order in the shop! Fluffbutts - This is a delightful plush of my own design. They are a beautifully sculpted, soft and cuddly creation that look like they could just come to life! They're 10 inches tall and could just melt your heart. Limited to 300 Pieces. The first 50 will come with a free gift! Blazing Star - Returning for her 3rd iteration, Blazing Star is the security mascot for BronyCon. Here you can pre-order her before she arrives at BronyCon for the 2018 festivities. Limited to 300 Pieces. The first 50 will come with a free gift! 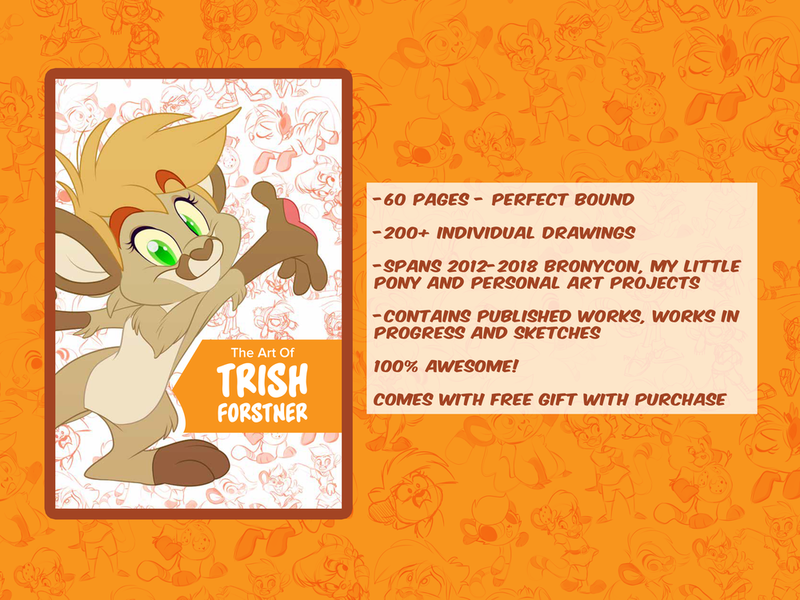 Lastly you can pre-order the self published Art of Trish Forstner book. It is a perfect bound, quality printed, full color masterpiece exploding with art from cover to cover! This collective adds over 200 pieces of art in all stages of completion! You'll see published works as well as works created from my own original characters! Limited to 100 copies. Each one will also come with a free gift! You can still order Blazing Star 2.0 and Gari in the shop as well at a significant discount! There are 4 shipping methods, be careful to select the correct one. International buyers beware SHIPPING OUT OF THE US IS VERY EXPENSIVE. I am sorry. Shipping costs do not include any taxes or customs fees. Be aware. I expect all items in hand by Mid-July. 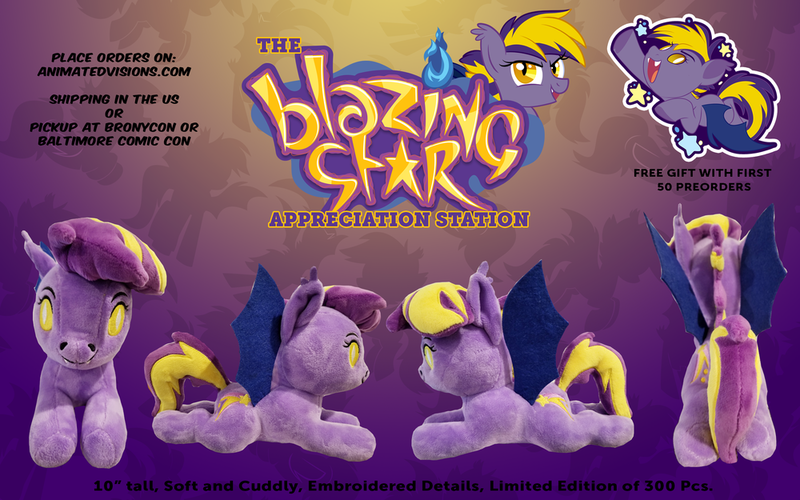 (Blazing Stars, gifts and Books are in May and the Fluffbutt Plush are due in July before BronyCon) I will update everyone via social media as we progress toward shipment! Thank you all for looking this over!